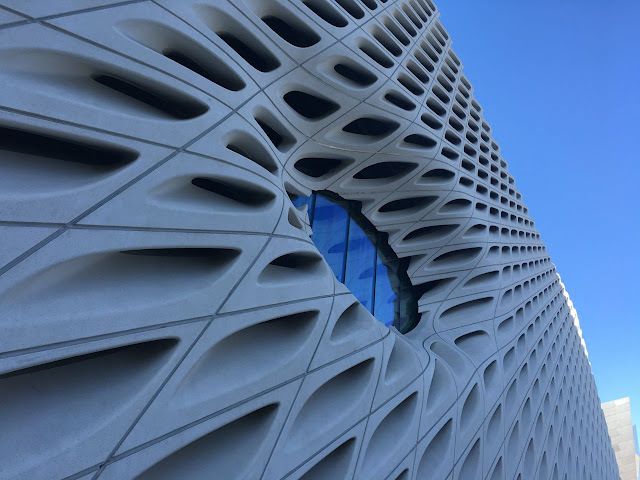 This past November I was in Los Angeles for a conference, and had a few extra hours to explore the city. 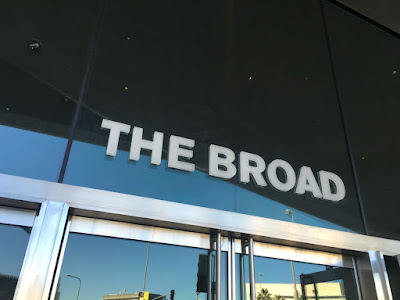 After a sunrise hike on the Upper Temescal Ridge Trail and a walk around the recently renovated Echo Park Lake, I drove over to the new Broad (rhymes with Road) Museum in downtown Los Angeles. The Broad is located at 221 South Grand Avenue. A small park was created next to the museum and adjacent Emerson hotel. Looking south down Grand Avenue. A couple of gourmet food trucks outside. The round window is one of the more distinct architectural features of the building. 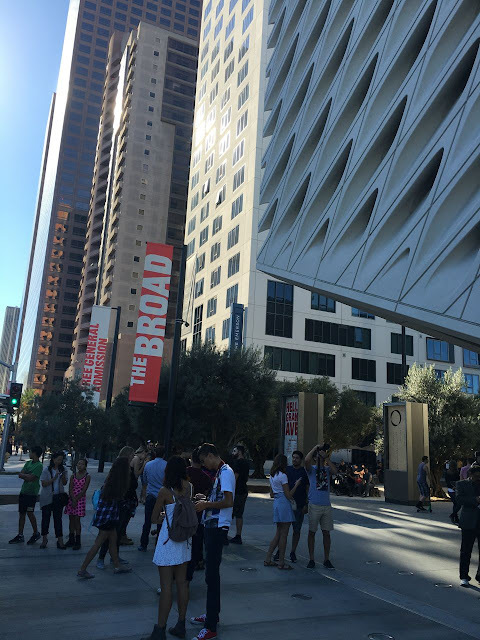 The Broad is fairly unique in that the entrance is actually off the street - located on corner of Grand Avenue and Second Street - bringing life to the street as people are coming in and going out of the museum. And waiting to get in. 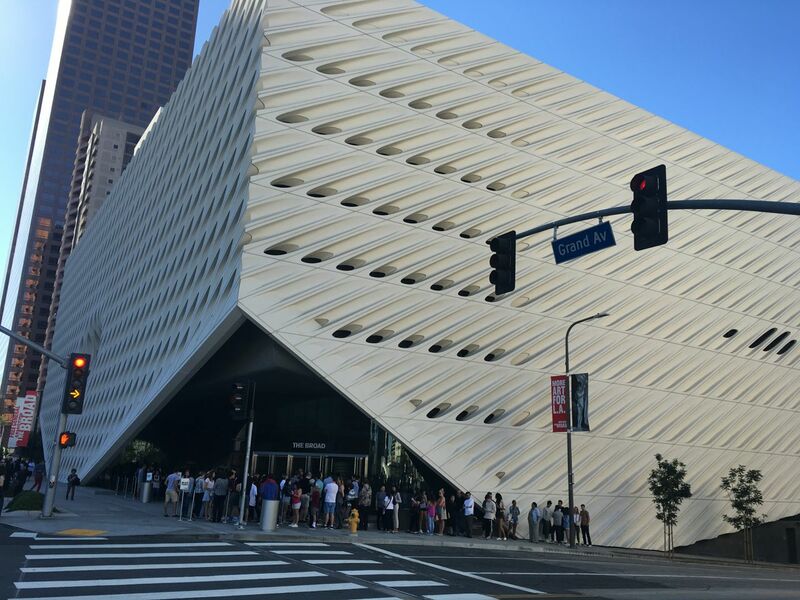 The good news - the great news - is The Broad is FREE. Which is also the bad news. Every single one of the free tickets is snatched up at least a month in advance. Fortunately, there is a standby line. 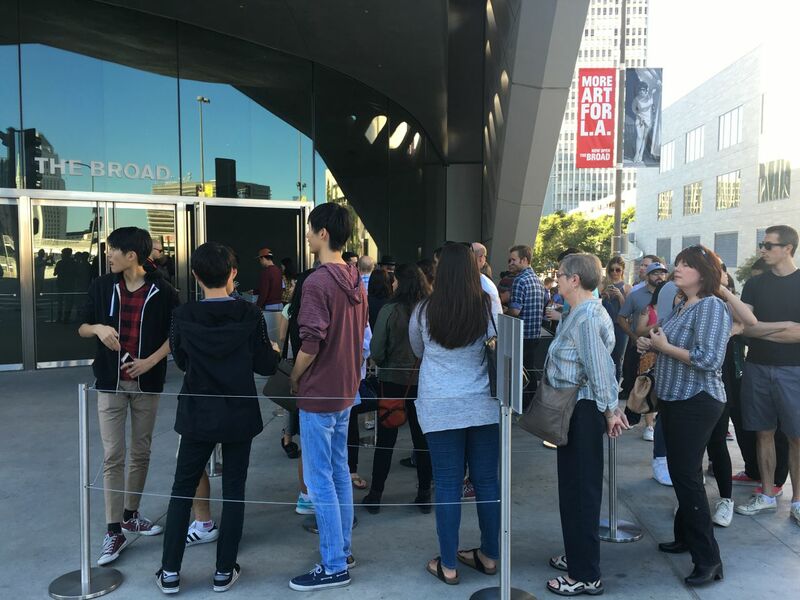 According the museum's website, it can be a 10-45 minute wait on weekdays, and a 60-90 minute wait on weekends. How long do people wait at, say, Disneyland for one ride - after paying $$$ to get in? The Broad is an entire museum and is free. All day parking on weekends is $12, or $8 if you park across the street. I put some quarters in a street meter for 20 minutes. I didn't want to pay full freight for parking - or wait an hour to get in. So, unfortunately, photos this time are limited to just the outside. Another view of the park outside of the museum. 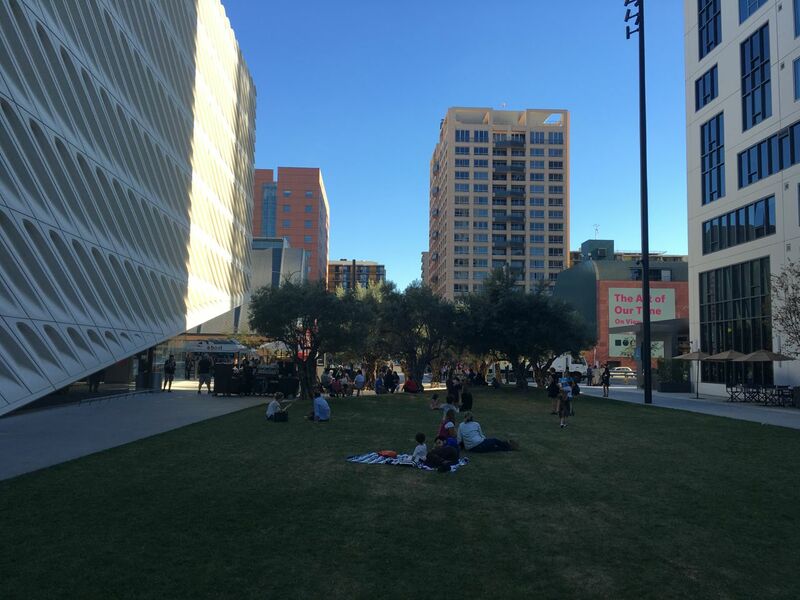 Lot's of people hanging out, enjoying an unusually warm November afternoon. 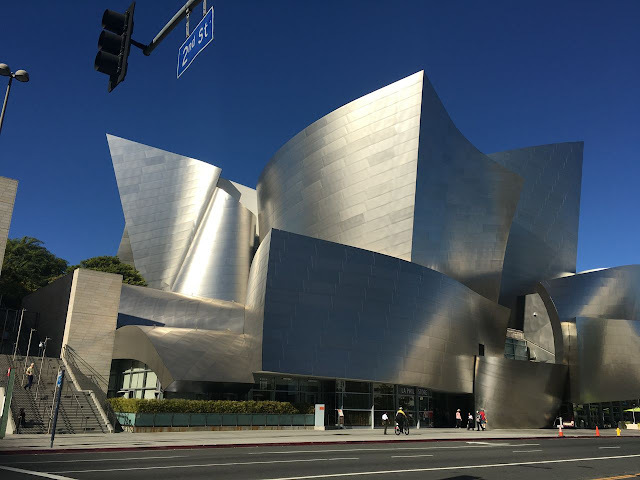 Across the street from The Broad is the Walt Disney Concert Hall. Here's a link to when my wife and kids and I enjoyed a free concert there several years back. 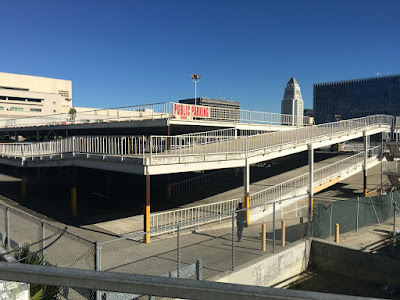 Across the street from the Disney Concert Hall, and diagonal from The Broad is this 50 year old parking structure - what I personally consider the ugliest structure in the entire city. This was built back in the 1960's as a "temporary" structure - and it's still there. 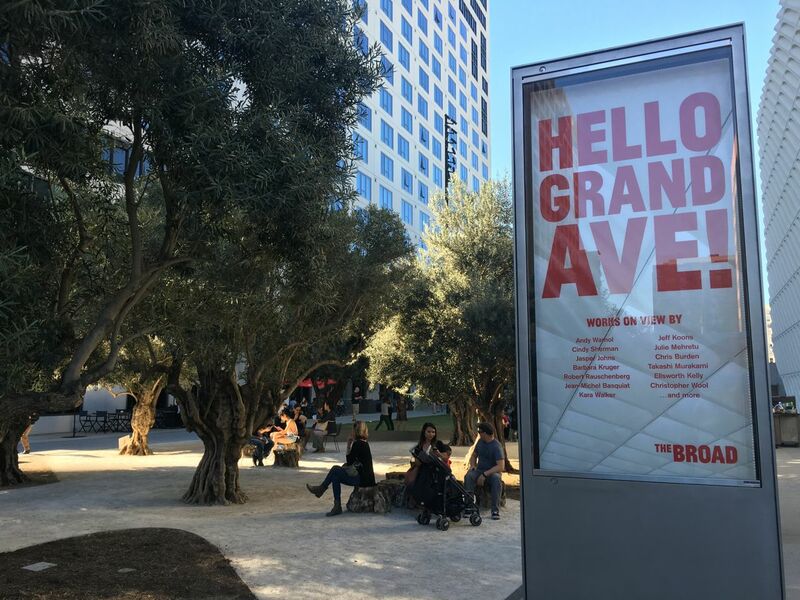 A massive development called the "Grand Avenue Project" was stalled back in 2008 - putting development once again on hold. Here's hoping that this can be finally be replace in the near future. 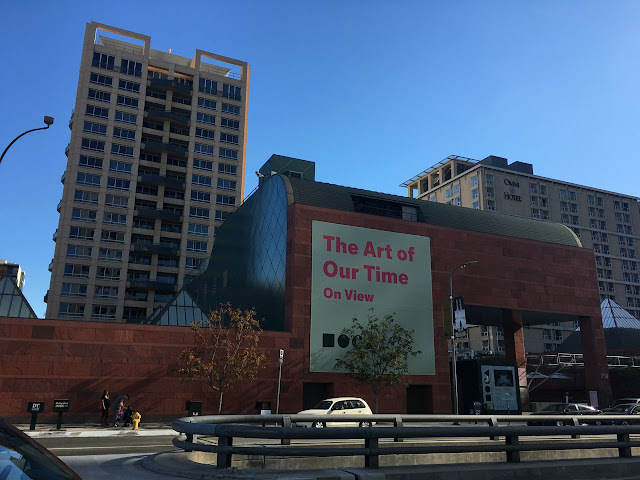 Across the street from The Broad, is the MOCA - Museum of Contemporary Art. Admission is $12, or free Thursdays after 5pm. If you'll notice in the photo above, there a railing in the middle of the street - the middle of Grand Avenue. What's that all about? Unknown to most people, Grand Avenue is actually a two level street. 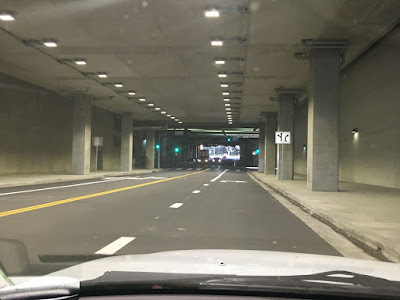 This section of Grand Avenue is part of Bunker Hill. 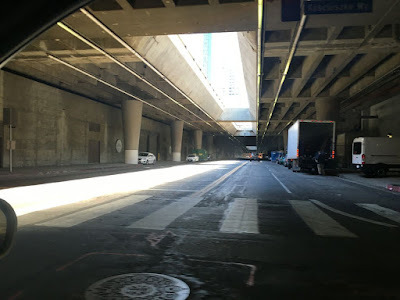 When the area was slated for re-development in the 1960's, Bunker Hill was flattened (at least, a little) and a two level road was built through part of it. The Broad, the Walt Disney Concert Hall, the Museum of Contemporary Art, and various other hotels, and office towers are located on the upper level of Grand. Then there's the lower level. 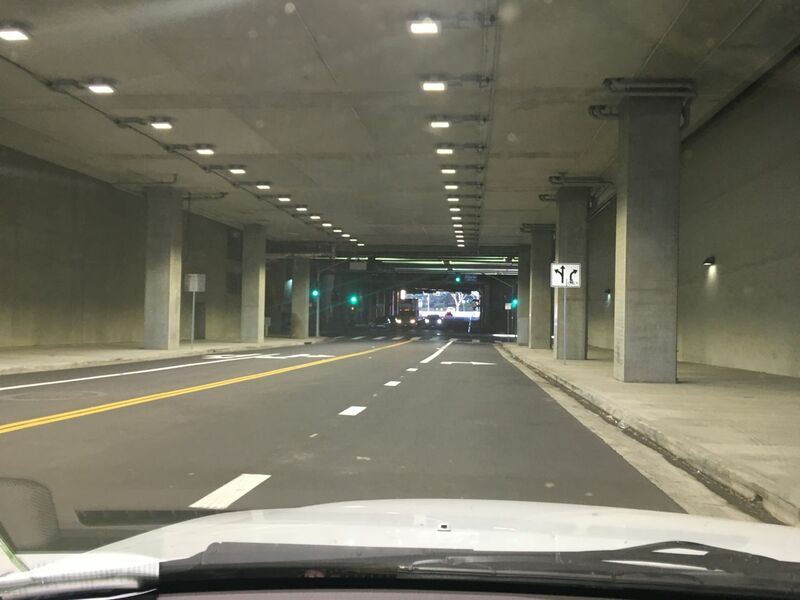 This is driving along the lower level of Third Street, with the intersection of Third and Grand ahead. 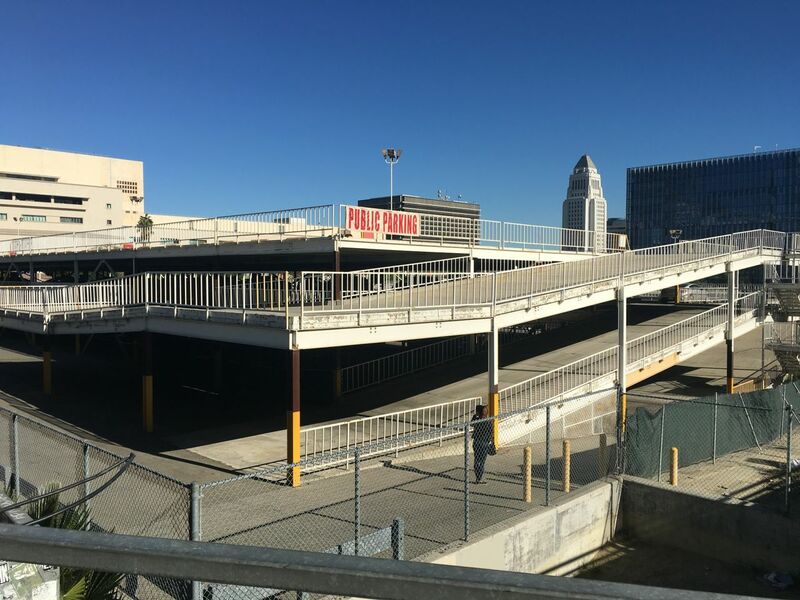 This is lower Grand Avenue - with the office towers peaking through the two upper decks of upper Grand. Despite the surprisingly clean and wide sidewalks, I would not describe this as pedestrian friendly. I wanted to see one more thing a few blocks away in downtown L.A.'s historic core - which is very pedestrian friendly. More on that next time.